Matthew McConaughey has been the guy who’s “so wrong, he’s right” for women like Kate Hudson and Sarah Jessica Parker in movies, but he’s never really taken to playing bad guys. So far, he’s only crossed over to the dark side to play a part-time assassin in William Friedkin’s Killer Joe, a drug lord in Scorpion Spring, and a backwoods semi-cyborg in Texas Chainsaw Massacre: The Next Generation. 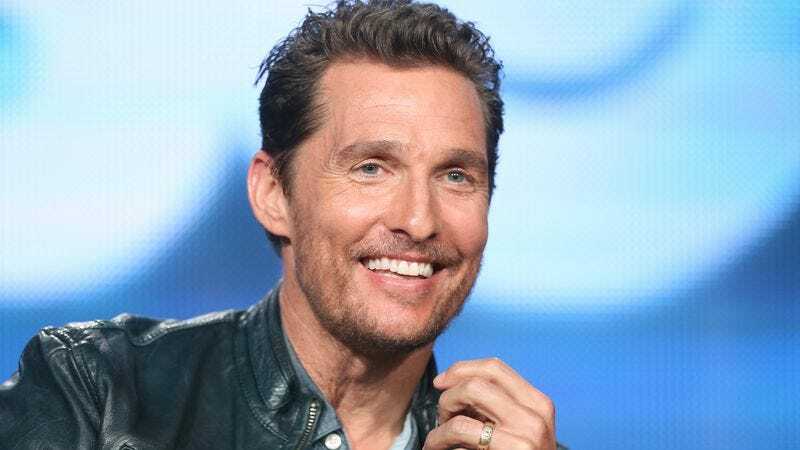 It seems McConaughey would rather stick to playing antiheroes these days, so perhaps that’s why he turned down the role of the villain in the Guardians Of The Galaxy sequel. While sharing some casting news for GOTG 2, Variety noted that Marvel and GOTG director James Gunn wanted McConaughey to play the villain in the sequel. The actor certainly seemed to be looking to get in on the MCU fun—in a May interview with the publication, he said he’d been reading scripts for both DC and Marvel properties, but ultimately didn’t consider any of them the right fit. It’s not clear why he turned down the role in GOTG 2, though. Could it be that McConaughey’s not a fan of ’70s music? Who knows, maybe he just didn’t want to get bogged down in all that fathers stuff. But at least the sequel has made its first new addition to the cast—that’s Pom Klementieff, who starred in the (unfortunate) Oldboy remake. There’s no word on who she’ll play, but we guess it’s entirely possible she’s replacing McConaughey.